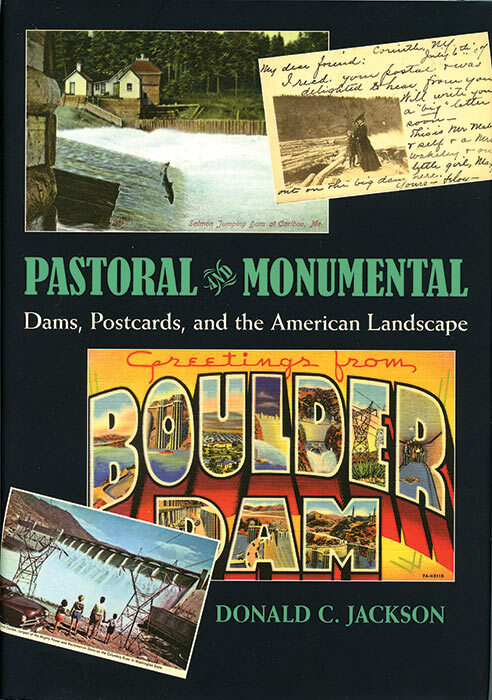 Pastoral and Monumental: Dam, Postcards, and the American Landscape is an original take on water resource development. Books on dams are usually politicized, often technical, and unnecessarily rhetorical. Rarely are discourses on river blockages as nuanced as Donald C. Jackson’s study. The postcard illustrations and highly readable text document the history of dam building in the United States. The book clearly shows the evolution from small dams that drove water wheels used for grinding grain or sawing lumber to mammoth multipurpose projects, which have debatable justification. Between the nostalgic era of “the old mill stream” and pork barrel government impoundments stand the heroic dams of the Depression. The public’s perception of these developments is extraordinarily told in popular imagery. The book is as well a phenomenal telling of the rise and fall of the picture postcard. I don’t recall any book on technology that quotes Susan Sontag and Errol Morris. In addition to Jackson’s reputation as a expert on engineering projects, it must also be acknowledged that he has a profound grasp on photography and mass media. Jackson has used postcards and photographs as source material, not merely illustrations of ideas. They contribute to the reader’s understanding of our perception of dams. This is a de facto history of the postcard – as good as any currently out there. People interested in postcards and photography (he includes snapshots and stereo cards as well) would enjoy this book, as well as anyone for or against dams. It’s a very handsome, substantial book, with color throughout (although many cards are monochromatic) and razor sharp illustrations and an excellent value. I’ve got three shelves of books on dams and this one is perhaps the most fun to look through. Books on important environmental matters need not be boring or pedantic.